I walked around the corner on to this street in Calgary and immediately saw the guy snow blowing the train station platform. Naturally with all the snow blowing around my first instinct was to put my lens cap on, and I did. Then I noticed this girl walking up the street too. I quickly removed my lens cap, adjusted my settings and snapped this photo. I am happy with the picture, however I think this shot might have been a little better shot at around f/4 or so, just so you could make out the snowblower guy a bit better. I still like the photo how it is though, mostly because I ‘m just crazy about blurry backgrounds :). 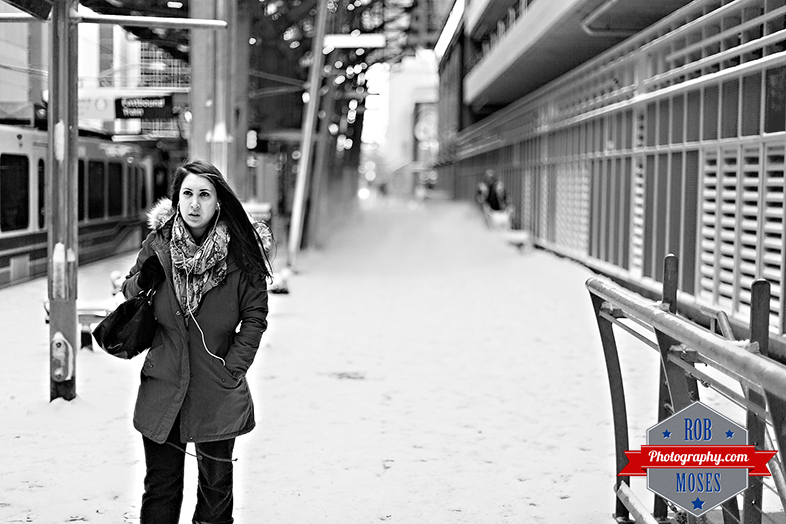 This entry was posted in Cities, People, Street Photography and tagged 50mm, 5D mark iii, 5D3, 5Diii, Alberta, Black & White, blur, blurry, Bokeh, C-train, Calgary, Canada, canadian, Canon, city, City Life, cold, girl, headphones, iPod, metro, photo, Photography, platform, prime, Snow, snowblower, station, street, subway, train, train station, Urban, winter, woman, yyc. Bookmark the permalink. Your photo has very firmly. I think it’s so great. Agree with you-blurry backgrounds are brill. Nice photo. I was certain that I had “liked” this photo. I remember looking at it and admiring the use of leading lines, the depth of field, and the balance. It’s great! OH well thank you very much. I rather like this one too :). Yes, the blurred background works. Glad you like it ;).